Reputedly covered by Bob Dylan (uncirculated "Don't Look Back" footage, Savoy Hotel, London, GB, May 2-6 1965). 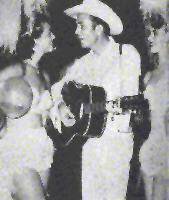 Original recording: Hank Williams (demo), prob. Castle Studio, Nashville, TN, Fall 1951 (composition registered with Library of Congress, 28 Nov 1951; overdubbed demo posthumously released on Polydor 825-551, 1985); first commercial recording by Ray Price, Oct 16, 1951.
as reprinted in The Songs of Hank Williams, New York, no date, pp. 134-135. But it can't chill my heart. Lord, I've been waitin' too long. Oh, sweet Mama, please come home.